I argued with myself for a few days, over the question of whether I should jump right into another century of books. I’m already missing checking dates, hunting down books for particular years, and seeing the list grow. There were so many authors I meant to read but somehow didn’t make the list. 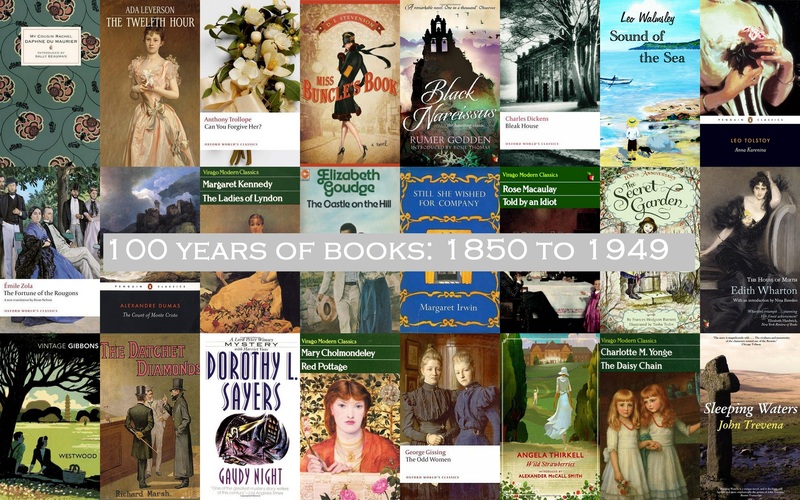 Authors like Rose Macaulay, Dorothy Whipple, Daphne Du Maurier, Sylvia Townsend Warner …. and I have half a dozen books on my library pile right now that I could fit into a new century. Though there are no set rules, I found that two years, one book per author, and a proper post for every book was the right plan for me. It’s important to be wary of online sources telling you the year of a book. I had books lined up, only to find the book in my hand wasn’t published in the year I was told. I know now to always look at the book! I know now to write everything down. Every book for every year – a choice of books is good, and my list changed so many times. Progress reports and short- term targets are a great help when the end of the century seems a long way off. I’m so glad I thought of 10% reports. Claire’s advice – given at the end of her one-year century – was spot-on. But I also know that I have been neglecting books, old and new, that didn’t fit the project. And that was a very bad thing. I tried to think of other plans but nothing else seemed quite right. I was much more at home in the first half of the twentieth century than the second, I have lots of Victorian novels that I want to read or re-read, and so I could have my project and build it entirely around books I really want to read. Two years – so that I can mix up my reading. One book per author – to encourage me to read widely. A proper post for each book. But there are no rules, and I’d love some company on the journey. Alternatively, if you’d like to read the twentieth century, Simon and Claire are setting out on that journey again, and I’m sure they would be happy for you to join them. « 10% Report: Reading the 20th Century – The End – or maybe not …..
I’m so happy you decided to do this again! Kudos. I am very tempted to join you on this one, although I might be more comfortable with the 20th century plan. But I really love this project, either way. I’m going to do some research and see if I can come up with a long enough list of books. And then, hopefully, you’ll have yourself a challenge buddy! By the way, are there certain resources you use to check the pub. dates? wow good luck – that sounds amazing – maybe I’ll do this one year – but not now as I already have a massive tbnr I must get dowen and two new reading projects and the conclusion of a third. I so look forward to your reviews of those books – you have a fantastic year ahead of you. 🙂 ( I think my perfect century might be something like 1880 – 1980 though. What an amazng idea Jane – best of luck! I would be the same with the 1990s and possibly 80s so you’ve done well to choose years that would suit you! Wow! I love the idea that you can choose your own century. Mine might be the 19th, all in itself, but I kind of like yours and Lisa’s too. I’m so very tempted to keep you company, even though I would be also be tempted to fill up the century with Thirkells, which would be cheating of the very best kind. But we have two years, you say? Hmmm. I was even thinking of 1814-1913, to allow for Jane Austen. Jane, I am starting to make a list – I have come up with at least 50 so far, just from my own shelves, though I think I’d allow more than one from the same author (all the Trollope waiting – and I’m in a Trollopian mood just now). While I was commenting on your previous post, this was exactly the time frame I had in mind – Mid Victorian era to early 20th century is my forte! Count me in! I missed these posts this year! I think I have been living under a blogging rock. It sounds like such an amazing idea, but I think it would definitely take me a few years to accomplish. But I do miss having a project that I can make lists for and read from. Maybe once I’ve tackled the ever-growing books I have in my apartment I can start pulling together books for this project and go to the library again. I’ll definitely have to go back through and read your posts. I love the idea and I’m excited to see how it went. What a lovely montage of book covers! Good luck with your reading project. I’m sure you’ll come across some treasures. Good luck with this! I have thought about trying it myself and it is tempting, but I’m not convinced that it would work for me – though I think 1850-1949 would probably suit me better than the twentieth century. I’ll look forward to seeing which books you choose, especially for the Victorian years! What an amazing plan. Have a wonderful journey! Oh I’m tempted, but I know that I have other priorities this year and to take on this would really just be an excuse for not meeting them. Maybe another year and thank you for the idea. Great idea! I’m excited about doing the 20th Century this year (I love the challenge of the second half, since, like you, I’m less drawn to books from those years) but might try this in 2015. Any reading project that can include Trollope sounds wonderful to me! Love your thoughts on completing your century. The incorrect publishing dates from online sources lead me astray a few times and I’m being much more cautious this time around. That’s a great idea — all the best. I look forward to reading about some wonderful new finds as you go along. And – Happy New Year! Great idea! Now I’m really tempted to look in my bookshelves and see what range of years I could complete. . . my goal is to read more books from my own shelves as they are really accumulating. Good luck and I look forward to reading your posts!